Over time, the performance and reliability of all computers – even that of a Mac® – slowly degrade as their hard drives get cluttered with crash logs or temporary files. 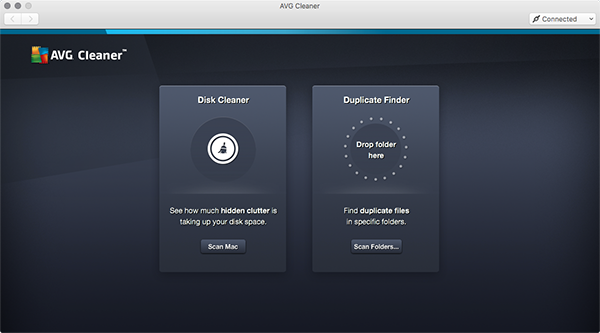 AVG Cleaner™ for Mac will clean out any leftover data and make space for more of your photos, songs, apps or movies. Download the app from the App Store and get it running! Click here to download AVG Cleaner and install it. Once done, launch the app. You’ll be greeted by our dashboard with the two main features of the app: Disk Cleaner and Duplicate Finder. We’ll start with the Disk Cleaner. True fact: almost every time you use your applications, play a game or browse the web, your Mac collects data “junk”. This “cache” data stores temporary files and collects information from errors and other system activities in countless log files. Click on the Scan Mac button in the Disk Cleaner tile. 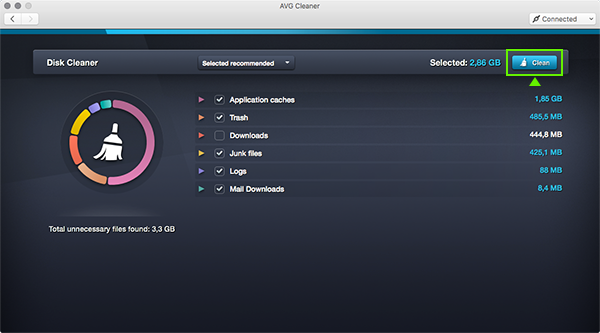 AVG Cleaner will then scan for leftover files, hidden caches, log files and other trash. AVG Cleaner can give you a detailed look at the files it has found. For first-timers, we recommend going through the list in the Downloads and Trash folders to see what you want to keep. There’s rarely any need to review cache or log files from your other programs – you can delete them safely. To see the results of the scan, hit the View & Clean button. The items that can be cleaned will be listed out. Click on the arrows to get more details about the items. Make sure to uncheck files you want to keep. Ready? Hit the Clean button! Who doesn't have duplicate files laying around in their computer? Some of us save, move and copy so many files that sorting them out seems like a lost cause. 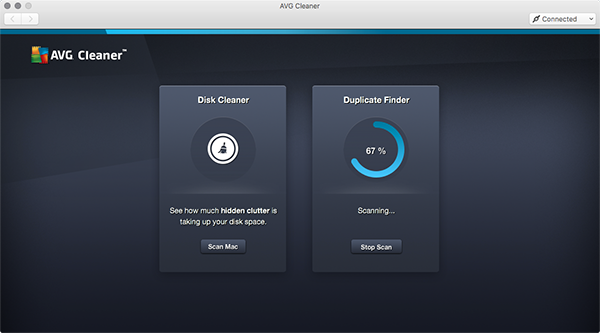 Thankfully, AVG Cleaner for Mac will find them for you. First, click on the Scan Folders button in the Duplicate Finder tile. Alternatively you can just drag and drop a folder from anywhere on your mac. 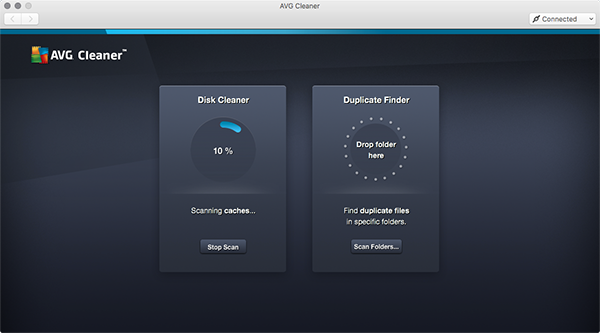 AVG Cleaner for Mac will then ask you which folders to scan. For first-time users, we recommend just scanning the home (main user) folder. Once selected click on Scan. Once the scan is finished, you’ll be able to quickly and easily go through all the duplicates to find out when they were created and where they sit on your Mac. From there, it should be easy to decide which ones you want to keep, or if you want to delete them all. To see the results of the scan, hit the View Results button. The items that can be deleted will be listed out. Click on the arrows to get more details about the duplicate files you’re about to delete. Make sure to uncheck duplicates you want to keep. Then, when you’re ready, just hit Clean to reclaim the storage space. Your Mac should have more free space for the things you love.